I have read several graphic novels and mangas at this point, and thoroughly enjoyed them, I thought it was time I attempted comics again. You may remember I previously mentioned wanting to get into the nerd culture of comics as I am a fan so many other nerd cultures staples. I dipped my toes in the manga market with series I was familiar with through anime; a pretty safe starting point. Then, I received a couple of graphic novels from Netgalley, and they have been utterly fantastic in their stories -- even if the art wasn't my match. This go around I requested something by a true, blue comic king -- Stan Lee. 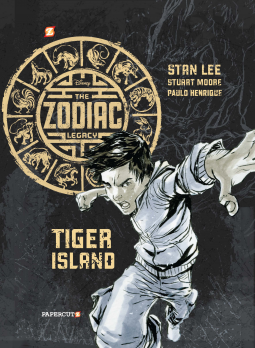 Stan Lee created a new universe of comic characters with writer Stuart Moore. They wanted an edgy Asian twist to their superheroes. Each character has the power associated with an animal of the Chinese zodiac. There are a series of books and a set of matching graphic novels. I picked up the graphic novel from Netgalley. I like East meet West kind of literature. Let's give is a shot. My impression -- Captain Planet meets a fortune cookie. The story line wasn't completely horrible, it was just super cheesy like Captain Planet. A group of random teenagers out to make the world a better place. It just screams 90s cartoon. Plus, the art kept my mind there too, bright colors and clothing styles all inspired by the era that put fluorescent accents on everything. The artwork was actually the piece I liked best about this novel. Maybe that should be my indicator. If I like the art style, I'm going to be in for a flop of a story. The previous two graphic novels I've read have not been visually to my liking, but I really enjoyed the character development and plot. Here the artwork plays to my nostalgic sensibilities, but the story liked any character depth. All we learn about the gang our their powers. Which don't get me wrong, they are super cool, but I want to know more about the characters. Their individual stories just seemed to be lost but very important. Honestly, if I need an Asian flair mixed in with my very Western mindset, I'll stick to my all time favorite Avatar: The Last Airbender. This series really just did not engage me. Now, other people may absolutely not feel the same way towards this series. It might be right in the wheelhouse of what they are looking for in their East meets West agenda. To those, I say pick it up and try it out. But maybe at your local library first. The price tag is a little hefty for the risk of not enjoying this graphic novel. To get more hyped up for the series, check out their website.